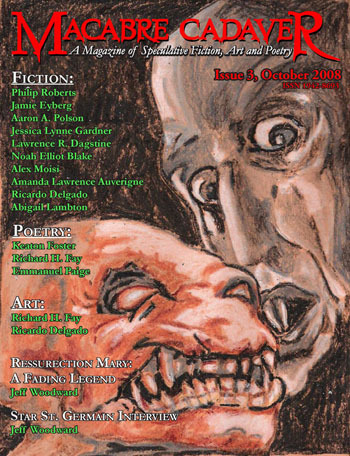 You can find me in the latest edition of MACABRE CADAVER. They have a delightful selection of stories, art, and poetry. It’s a free PDF download, too, so why not try them out? Featuring Works by: Jamie Eyberg, Amanda Lawrence Auverigne, Aaron A. Polson, Philip Roberts, Jessica Gardner, Lawrence Dagstine, Noah Elliot Blake, Alex Moisi, Abigail Lambton, Ricardo Delgado, Jeff Woodward, Keaton Foster, Richard H. Fay, and Emmanuel Paige.